Sorry, this was not made in Word. I was trying to figure out how to make a 2nd page you could edit and print in word so you could run the paper through your printer twice to make the invitations but couldn't figure out how to get the words to turn in Word. I am curious how you add the words once you have already printed the document? You will have to run the same paper through your printer twice. Once to print the PDF, and once to print the words on it. Good luck! Hope you enjoy the invitations! I opened the document in Photoshop. From there I typed our customized invitation wording. Make sure it is exactly as you like. In fact, I make a "text box" for each set of descriptions: date (its own box), place (its own box), etc. Then I lined it up with all the right spacing. From there I hit: ctrl + T to rotate the words -45 degrees. This turns it all to center in the lower corner. While in the ctrl/T I can move the whole thing to be placed correctly. It is much easier than it sounds. I have not figured out how to do this on word or publisher, though I am sure there is a way. It turned out so cute!!! On the back of the card you will see the origin of the original design so they get all the credit they so greatly deserve on this really unique invitation! This is such a cute invitation! Thank you for sharing!! Thanks Nicole! It is notes like this that make it all worthwhile. Working with cubs is such a fun thing to get to do. THANKS so much for sharing your fun ideas and files--it's so nice to have the work done:) Placemat, napkin ring and invitation are perfect for our pack! I used print shop for the wording and then rotated it in the corner to print. Easy peasy. I'm so glad you like it, and that it was so easy for you to add the words! 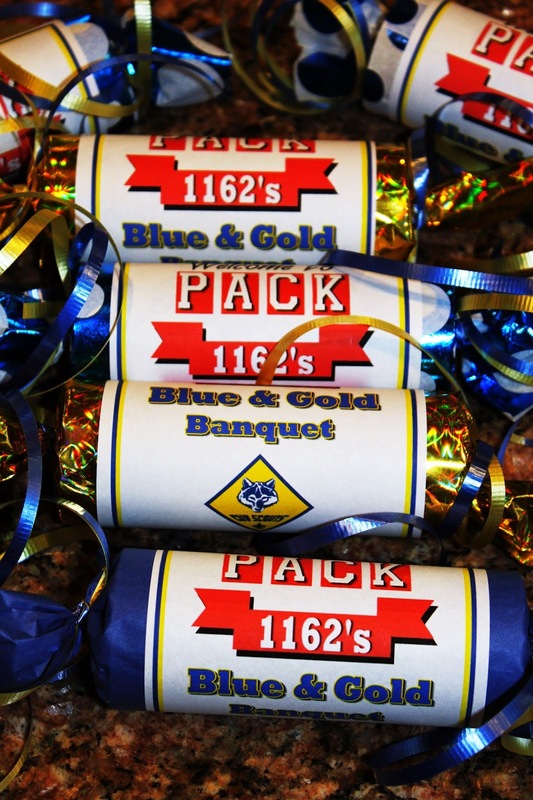 Hope you have a great Blue & Gold Banquet! Great idea, I was able to put into Microsoft Publisher and rotate the text. I'm very excited to be able to share this with my boys. Thanks for sharing your great ideas. Your awesome for sharing your creativeness. VaLayne - you were a fabulous help today! Thank you! I ended up making my own template - I used Pages on my Mac. But if it hadn't been for your post (and finding it plastered all over Pinterest) I wouldn't have ever thought of this! If you're interested in seeing mine, feel free to email me at iamjenwilliams@gmail.com. 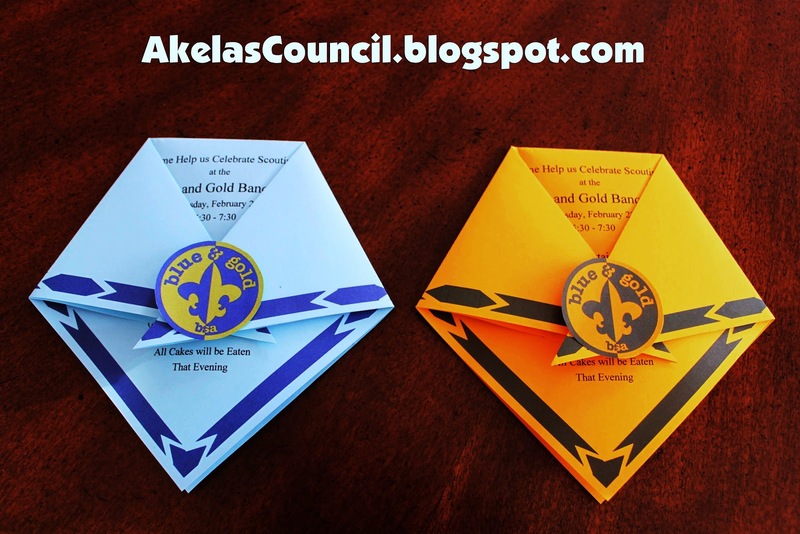 Our Blue & Gold theme this year is "100 Years of Scouting" (it was 100 years ago this year that BSA invited the Church of Jesus Christ of Latter-Day Saints to partner with them) - so I included the Centennial logo on the inside (instead of the Scout holding up Akela ears). And I figured out how to make that neckerchief border! Ohmygoodness, it was difficult, but I did it! Thanks, again, for your communication throughout the day! THANK YOU FOR THE WONDERFUL IDEAS!!!! Awsome ideas! Being a teacher, I appreciate the time it has taken to make all the documents and love that a person is able to edit and print to fit my cub pack needs. Thank you so much!!!!!! 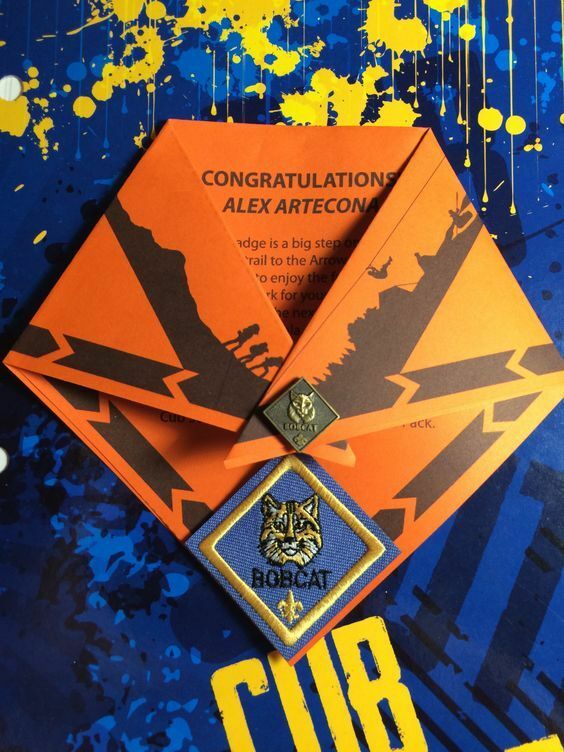 We will be using the invitation to invite parents to the new cubs investiture this fall! Thank you! I copied and pasted the PDF into Word 2013, then added a text box with our customized invitation, which I could rotate and move into the correct position. I also removed the border and background from the text box so it wouldn't cover up any of the background image. Is there a version we can add or edit the text so we can print once? The doc version above can be edited. I'm pretty sure there was another neckerchief printable on this blog. Where is the one that was rank specific that you could print? It had different layers that you could turn on and off depending on the rank you would want to print. I've searched all over and can't find it. Help!